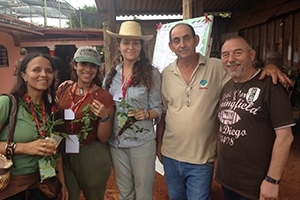 AU 2030: Garrett Graddy-Lovelace | American University Washington D.C.
Garrett Graddy-Lovelace in Cuba with an international delegation of farmers and agrarian leaders. In the United States, terms like “locally-grown” “organic” and “biodiverse” conjure up images of metropolitan and coastal elites caught up in the latest health craze. Yet Garrett Graddy-Lovelace’s research demonstrates just how vital these concepts are for sustainable food production all over the world. Agricultural biodiversity is both an ancient practice and a common goal in developing countries, she notes. Graddy-Lovelace, a School of International Service professor at American University, focuses on agricultural policy and agrarian politics. She’s not just studying food, but examining agriculture’s relationship with political economies and the environment. In the AU 2030 areas identified for investment, her research falls under environmental studies. Graddy-Lovelace is currently working on a book about agricultural biodiversity. It’s something she’s studied rigorously, both here in Washington and in the fields of the U.S. and Peru. She’s analyzed the pitfalls of one-crop production, or what she more broadly calls monocultures. Newer processes like GMOs encourage single-crop, highly concentrated agricultural systems, which leave communities vulnerable to fluctuations in the global economy. “A genetically uniform field is very precarious, even apart from climate change. Now that we’re dealing with climate change—and the weather is getting very erratic—it’s logical to have a more biodiverse crop base. But our subsidy system, ag policies, and trade system are not geared to biodiverse crop bases,” she explains. Graddy-Lovelace is researching seed saving, a practice propelled through informal networks and formal programs like gene banks. Farmers identify plants with strong growth, and they replant them in other gardens or farms the following year. Graddy-Lovelace says that, especially for low-income communities, this bolsters nutritional caloric intake and environmental conservation. But seed saving also fosters cultural identity. President Barack Obama’s move to normalize relations with Cuba has agricultural ramifications for both countries, which Graddy-Lovelace analyzes in a forthcoming paper. U.S. agribusinesses are eager to sell rice and wheat there, and Cuba has a desire to import more food. Yet, she stresses, Cubans want to prevent the decimation of their domestic, agroecological farms. After its benefactor the Soviet Union collapsed, and the U.S. tightened its embargo, Cuba adopted new programs out of necessity. They converted sugar farms, enhanced agrarian cooperatives, and established organic, biodiverse practices. “It’s not perfect. But they have one of the most advanced urban agricultural situations,” she explains. Graddy-Lovelace recently helped organize an event at SIS called Cultivating Dialogue: U.S. & Cuban Agricultural Cooperatives. She’s also lending assistance to the 2nd Annual Washington, D.C. Food Tank Summit on April 20-21, to be held at Greenberg Theatre and including an impressive array of speakers. U.S. policymakers have come under fire for heavily subsidizing agricultural exports. This enables the U.S. to sell goods under the cost of production—a “dumping” process that critics say undermines farmers in developing nations. Graddy-Lovelace says these subsidies are more a symptom—and less the cause—of what ails the global agricultural economy. “The problem is that there’s an overproduction of commodity crops. Farmgate prices are so volatile and chronically low that, in the U.S. and elsewhere in the world, farmers are unable to make a living,” she argues. About those structural defects hampering American farmers? Graddy-Lovelace understands them from personal experience, and they’re what drew her to study agriculture in the first place. Graddy-Lovelace grew up in a farming community in Kentucky. Her family grew tobacco, and she spent summers chopping and topping that crop. She initially wanted to flee farm work altogether. However, after traveling to various corners of the globe, she realized that agriculture was about so much more than simple sustenance. She has also explored the religious elements of tilling the fields. She earned her master’s degree from Harvard Divinity School, focusing on environmental ethics, before returning home to work the family farm again. They started to diversify beyond tobacco, cutting fresh flowers and selling them at farmers’ markets. “It was a great experience. I loved being on the land and farming, but it did not pay my student loans,” she recalls. Graddy-Lovelace began to question the entire system. “What is going on? Why can’t small-scale family farmers make a living? So that was my research question.” She then earned her doctorate at University of Kentucky. She came to AU in 2011, and she is still pondering the inherent flaws of how we grow and sell food. She teaches a grad school practicum that partners with two diverse grassroots coalitions of under-represented growers across the country, working for food and farm justice. “They tell us what research they need about farm bill reform, and my students and I gather that data, do that analysis, and get it back to them,” says Graddy-Lovelace. It pretty much epitomizes research with an impact. And by maintaining scholarly and personal ties to agrarian communities, it sums up her career.